For the last post of the year, today I want to share my top 10 beauty products for 2013! For products that I have previously wrote about, please refer to the original posts for detailed reviews. For products that have not previously been in the spotlight, I will comment briefly on what makes it such a wonderful product. Let's get started! Having been around for 150 years, Bourjois makes a pigmented baked blush with history. The shade 15 Rose Eclat is a matte pink that lasts all day on my cheeks. The formula applies with a powdery rose scent and blends beautifully. I think this product is also branded as L'Oreal Sublime Soft Pure Micellar Cleansing Water in mainland Europe. Regardless of the name, I adore this micellar solution. It is the best cleansing water for the value that I have tried. I am heading into my third bottle and I already have multiple back-ups. I have jet black hair and equally dark brows. The color match isn't perfect, but this twist-up pencil does a great job filling in my brows to make them more defined. The formula is creamy and glides on smoothly. Although convenient, the included spoolie is a bit too stiff for my liking. Overall, for $5-6, I am very happy with the natural results that this drugstore brow product delivers. This is the perfect true black liquid eyeliner that glides on, stays on, doesn't smudge, doesn't flake, is waterproof, and removes easily. This golden eyelash curler is the reason why I purchased the $19 limited edition Tarte Strike A Pose Statement Lash Set a few months back [Read Here]. The handle on this eyelash curler is quite unique, but remains user-friendly. The padding fits the contour of my eyes perfectly and I have never experienced any pinching in the months that I have used this product. The most praise-worthy is the result, this eyelash curler gives my lashes the most natural, but noticeable curl that holds for hours. The extra pad included is also appreciated. Just a side comment on the accompanying Tarte Lights, Camera, Flashes mascara that didn't impress me beyond its beautiful gold tube. The spiky plastic brush was in its favor, but a lot of product tend to bunch up at the tip. I find the formula gets dry fairly quickly and clumps a lot once it does. It also smudges quite a bit under my eyes, so I will not purchase the full size. The miracle overnight cure for any dry lips. I love each and every one of the 4 gloss sticks that I own. I have previously wrote in detail about three of the lighter shades [Read Here], today I want to include the more winter-appropriate Plum Jam into the mix. Plum Jam has the same delicious vanilla scent, moisturizing semi-sheer formula, and glossy finish as with the other three shades. This wearable berry color is what I have been falling back whenever I need a lip product that I can rely on. This is my absolute favorite fragrance and I am about half way through since purchasing it in February. As it is an expansive fragrance, I save it for special occasions. My favorite way to wear it is to layer it over Jo Malone Red Roses [Read Here]. This hand cream has been a long time favorite. I like the other two L'Occitane hand creams that I have tried (Cherry Blossom and Pivoine Flora), but the original shea butter formula works best for me. I am currently using the limited edition Passionate Jasmine and I look forward to opening the tube of Rose Tenderness. I didn't pack shower gel when I went up to Montreal [Read Here] since I thought I would make do with the hotel ones. I ended up really disliking the hotel ones, so I bought a small bottle of this Olay Silk Whimsy Moisturizing Body Wash the second day to get me through the rest of the trip. This body wash creates the most luxurious lather and it fills my shower with a sweet rose scent. The formula is also thick enough to be used as shaving cream if you apply straight from the bottle. Even in the winter, I can get away with skipping lotion for 2-3 days and rely on the moisturizing effects of this body wash. Sadly, I couldn't fit the bottle into my luggage, so I left it behind when I packed up. When I returned from my trip, I found out that this line was being discontinued. 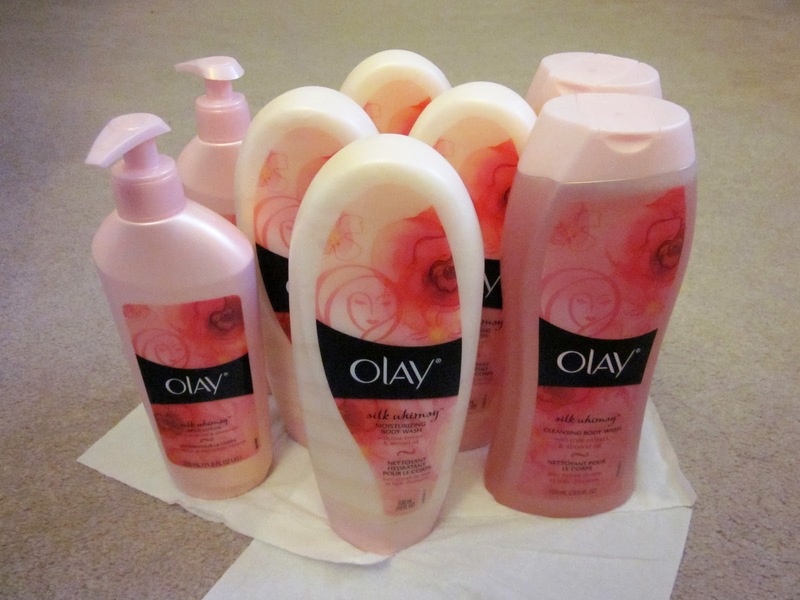 After hunting down several drugstores, I stocked up on the Moisturizing Body Wash, the Cleansing Body Wash, and the Body Lotion from the Olay Silk Whimsy line. In addition to other body products that I already own, I probably don't need to make any more body wash or lotion purchases in 2014. What are your favorite products in 2013?